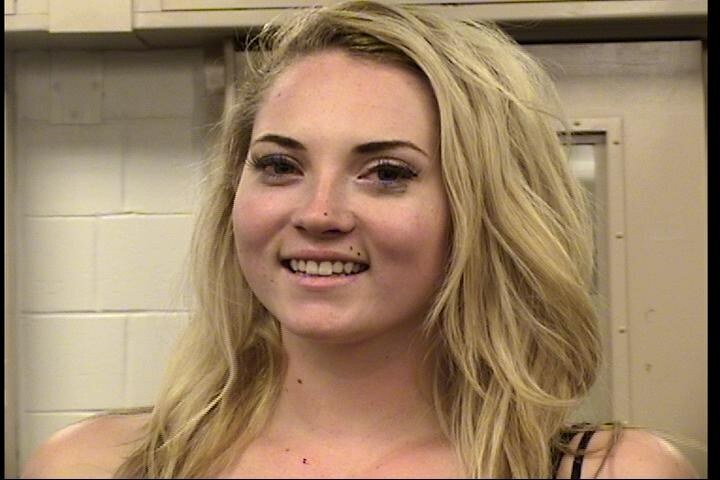 Bryelle Marshall was arrested after failing to complete field sobriety tests. Bryelle Marshall, 23, was arrested and charged with Battery, Aggravated DWI, and for an expired license plate after her vehicle was reported seen driving recklessly. Southeast Area Command officers were dispatched to the area of Zuni Rd and Pennsylvania Ave after reports of a black Volkswagon sedan was observed driving reckless in the area. Officers located this vehicle parked partially in the roadway of Zuni Rd and a driveway to a trailer park near a concrete wall. The driver, Bryelle Marshall, appeared to be passed out behind the wheel and officers were able to wake her up when they started speaking to her. Marshall was asked to step out and appeared to be extremely intoxicated by stumbling and having a difficult time listening to officers commands. A DWI officer was on scene giving Marshall instructions on how to complete the Standardized Field Sobriety Tests (SFSTs) to which she responded by doing cartwheels in front of officers. The DWI officer gave her several opportunities to complete these tests to which she appeared to be having a difficult time comprehending what the officer was requesting. The officer explained to her several times that this was a serious matter and she continued to laugh. During the time the officer was attempting to demonstrate the tests, Marshall completed another cartwheel and struck the officer in the back. At this point Marshall's opportunities to complete the tests were over and she was arrested. Marshall was asked by the officers to open her mouth to ensure she was not chewing gum, food or candy. This was to ensure the breath test would be accurate. However she refused to comply with the officers commands on this as well. Marshall was charged with Battery, Aggravated DWI and for an expired license plate. Officers on-scene were extremely patient with Marshall, giving her several opportunities to complete the required tests. Based on the observations officers made of Marshall's sobriety this situation could have been a lot worse. DWI is a serious offense and officers take this very serious. It is unfortunate decisions are made to drive after drinking. Marshall was booked into MDC and was released the next day.